Seats in the European Parliament representing England, Scotland and Wales are distributed according to the D'Hondt system, a type of proportional representation. The nations are divided into 11 electoral regions: nine in England, plus Scotland and Wales. Parties vying for election submit a list of candidates to the electorate in each region for their approval. In the first round of counting the party with the most votes wins a seat for the candidate at the top of its list. In the second round the winning party's vote is divided by two, and whichever party comes out on top in the re-ordered results wins a seat for their top candidate. The process repeats itself, with the original vote of the winning party in each round being divided by one plus their running total of MEPs, until all the seats for the region have been taken. The Conservatives win the largest number of votes, and the candidate at the top of their list is elected. As the Conservatives already have one candidate elected, their vote is divided by two (one, plus the number of MEPs they have). Now UKIP comes out on top, and the candidate at the top of their list of candidates is elected. After UKIP's vote is divided by two (one plus the number of MEPs they have), Labour wins and its top candidate for the region is also elected. After Labour's vote has been divided by two, the Conservatives are back on top. The candidate in second place on their list is elected. Since two Conservatives have now been elected, their original vote tally is divided by three (one plus the number of MEPs elected), and the Lib Dems secure top spot and their first MEP for the region. The Lib Dem vote is now divided by two (one plus the one MEP from round 5), leaving UKIP to top this round and win a seat for the second person on its list. 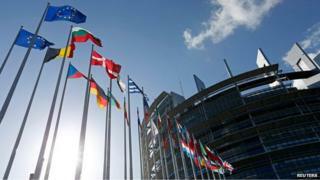 All six seats in the European Parliament for the region have been allocated. In Northern Ireland, a different system is used to elect its three MEPs. Voters have a "single transferable vote", meaning that they are able to rank the candidates in order of preference. To make the system work, officials first need to calculate a quota. They take the total number of valid votes cast, then divide it by the number of seats available plus one, i.e. four, then add one. In the first round, if any candidate secures more first-preference votes than the quota, they are elected. Surplus votes, i.e. those received above the quota, are redistributed among the other candidates. If not enough candidates have yet reached the quota, then the candidate with the lowest number of votes is eliminated, and the lower-preference votes of their supporters are again re-allocated. This process is repeated until the three posts have been filled.